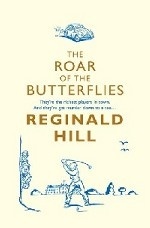 Аннотация к книге "Roar of Butterflies"
A sweltering summer is always bad news for the private detective business. Thieves, fraudsters and philanderers take the month off and the only swingers in town are the ones on the 19th hole of the Royal Hoo Golf Course. The civilized reputation of the "Hoo" is in trouble, however. Shocking allegations have been directed at one of its leading members, Chris Porphyry. When Chris turns to Joe Sixsmith, PI, he`s more than willing to help (well, he hasn`t got any other clients). Before long, though, Joe`s on the trail of a conspiracy that starts with missing balls, and ends with Формат: 13 см х 19,5 см.